Crop farmers have an enemy which shows its face throughout the growing season. This enemy is weeds. We have adopted two primary methods to try and combat this enemy throughout the years namely mechanical and chemical control. 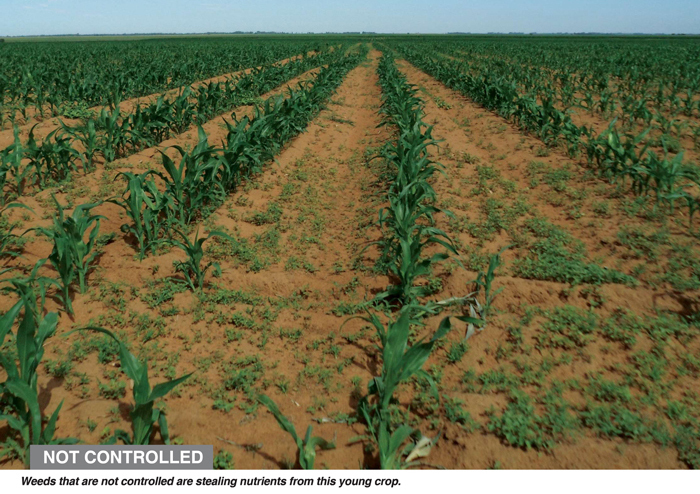 In this article we will look at chemical control and in particular the use of post emergent herbicides on our crops. 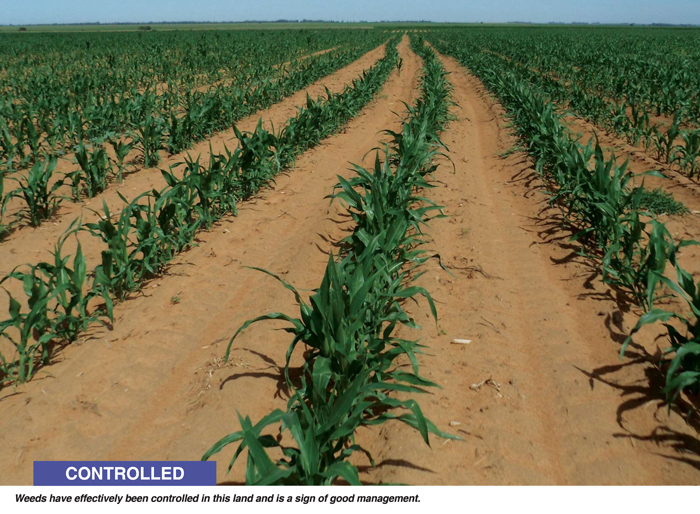 Post emergence herbicide refers to the use of chemicals that will take action on weeds after they have emerged from the ground. At this stage they will already be absorbing sunlight and transferring this absorbed energy into rapid vegetative growth. This will have a negative effect on our crops as these weeds will be competing for the same nutrients; this is why it is crucial to burn them down by means of a chemical spray application before they get out of control. The earlier one sprays the better. Post emergence herbicides take action on the weeds by contact. This means that we want good contact of our spray droplets to be made on the leaves of the weeds. In other words, we want the chemical to stick on the weeds leaves so that as much as possible can be absorbed into the plant to destroy it. It is extremely important to have little to no wind on the day that you are spraying. Too much wind will have a negative effect on the contact that the chemical will make with the weeds. This is due to the drift that will occur. If chemical drift happens you may also have the problem of causing damage to surrounding field crops that you did not intend spraying. Remember that there are specific post emergence herbicides to use on certain crops. 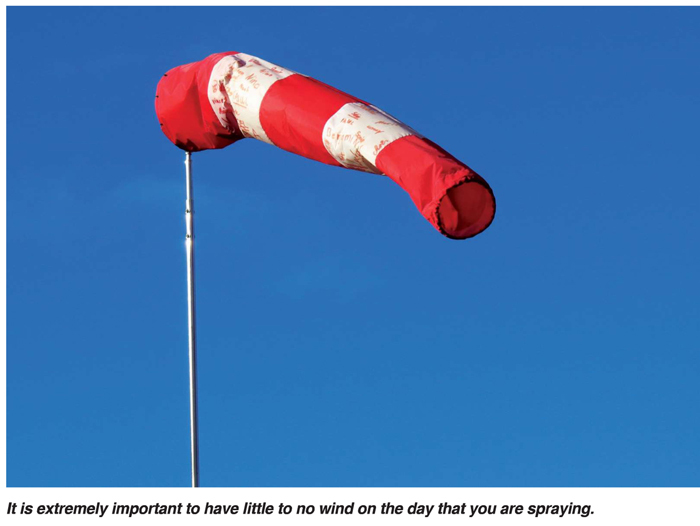 From a health point of view, it is also more dangerous to spray in windy conditions as more chemical is moving through the air, which if breathed in could pose a health risk. Always be sure to use the correct protective gear when working with chemicals, regardless of the wind conditions. This includes a breathing mask, gloves and protective eye wear. 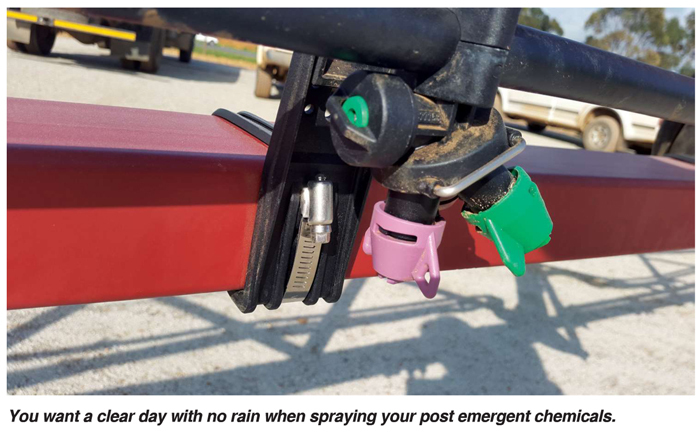 You want a clear day with no rain when spraying your post emergent chemicals. This is important to remember as opposed to pre-emergent herbicides when it helps to have some rain to pull the chemicals into the ground. On a sunny day the weeds are also actively absorbing sunlight and nutrients, therefore when the chemical comes into contact with the leaves it will effectively be absorbed. 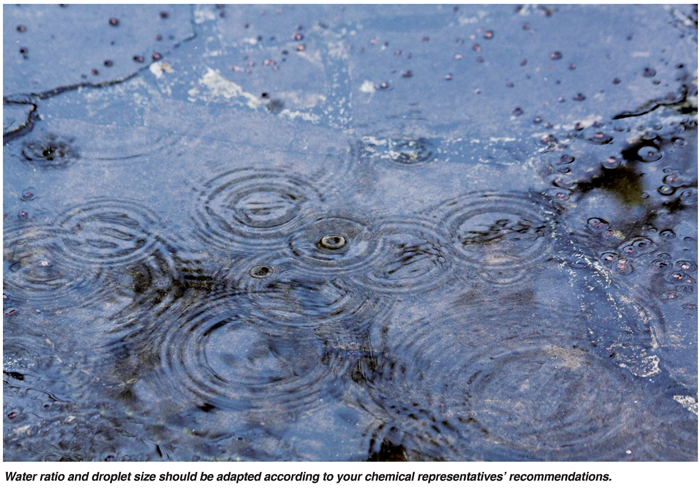 This will depend on the type of chemical you are applying which is why it is very important to consult with your chemical supplier and ask for their recommendation on water ratio. In general, you usually want to apply approximately 150 litres/ha of water with a fine mist spray. In doing this you will achieve a small droplet size increasing your chemical coverage on the plant. One always wants to keep to a constant speed. When you do your calibration of the spray you should base your calculations on a certain speed which will be determined by the topography of your field. Try not to vary this speed as it could alter your overall application rate. 10 km/hour is an easy speed which is not too fast or too slow and it helps with easier calculations. It is advisable to make use of a sticker when applying post emergent herbicides. This is an additive which you combine in your chemical mixture. This additive helps the chemical to ‘stick’ to the leaves of the weeds to achieve a better result. One should also consult a chemical representative to find out the best sticker option that compliments the chemicals that you will be applying. This sticker will also help the chemical to be more resilient on the leaves even if a little rain falls after spraying. As was briefly mentioned before, always be sure to use the correct chemicals on the correct crop. Certain chemicals do not work on certain crops and in some cases can wipe out your entire crop. Always be sure to consult with your chemical representative to make sure that you apply the correct chemicals to achieve the desired result. Always be aware of what is happening in your field. Weeds can grow very rapidly and can have a detrimental effect on your potential yields if left unmanaged. Always be sure to do routine checks throughout the season to make sure that you keep the enemy at bay.